Imagine is dead — long live imagination. After months of rumours and counter-rumours, the lively, publicity-seeking Liverpool software company has collapsed owing half a million pounds to its bank and creditors. The company founded by Mark Butler and David Lawson, who originally split away from Bug-Byte, has lasted a little over a year, having attracted enormous news coverage from all the media including television. Shortly before the collapse, Imagine was claiming to be worth in the region of £30 million. But behind the facade of software bustle, money and fast cars there has been a long history of internal discord. The earliest rumours of Imagine’s instability started before Christmas when a large amount of their massive advertising bills remained unpaid. The ads had been booked by Imagine’s agency, Studio Sting and an estimated amount of over £50,000 of advertising was unpaid when Studio Sting went into liquidation. The agency’s proprietor was Stephen Blower, who was also a shareholder in Imagine. Blower became a victim, according to close witnesses to the Imagine in-fighting. 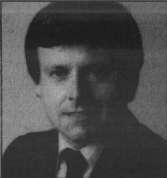 Another member of Imagine’s staff to fall foul of the founding fathers was Alan Maton, who has also been at Bug-Byte. He hadn’t been with Imagine for very long when he became unwillingly involved in a somewhat messy situation which was the creation of another company intended as a hidden offshoot of Imagine. When Alan was offered a more suitable partnership and the chance to run his own affairs away from the fog of the Butler/Lawson administration, he took it and Software Projects was formed. For months afterwards Maton was forced to retreat behind a legal shield as all manner of threats and writs were hurled in his direction by the apparently incensed Dave Lawson acting in Imagine’s ‘best interests’. Maton was accused of setting up a rival software company with secret inside knowledge of Imagine’s business dealings. 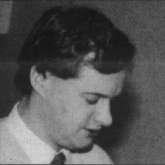 When Colin Stokes, sales manager for Imagine, left the company and went to work for Alan Maton’s Software Projects, he was faced with the same barrage of invective, both verbal and legal, with Imagine publishing in their Newsletter a whole chunk transcribed, it is claimed, from telephone conversations between Colin and Imagine’s competitors in the business. Colin had come under the heading of ‘unreliable’ in the Butler/Lawson cannon and so his office phones had been bugged. Imagine had over expanded. It was booking its own ads in the magazines and not paying for them. Debts were mounting with tape duplication firms remaining unpaid. A few weeks ago, being pressed for payment, Imagine sent out a duplicated letter to creditors saying that they were expecting to receive £250,000 within 21 days and would settle all accounts at that time. The deadline came and went. No wonder, Messrs Butler, Lawson and Heatherington were not in the country — at least, according to Bruce Everiss, Operations Controller of Imagine, David Lawson and Ian Heatherington were in San Francisco trying to raise more money. Responsibility for Imagine’s financial affairs belongs to Ian Heatherington, who together with Butler and Lawson form the Imagine triumvirate. 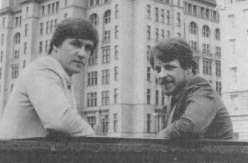 According to Bruce Everiss, when Heatherington saw the state he had allowed things to reach, he formed a personal survival plan together with Dave Lawson. The idea was to form a new company and gradually transfer the assets of Imagine into it. This would normally be subject to legal scrutiny by any creditors, but according to Everiss they had the best lawyers money could buy and the whole is water tight. The new company is called Finchspeed and its directors are Mark Butler, David Lawson and Ian Heatherington. Finchspeed is expected to take about 20 staff from Imagine, the minimum needed to produce the mega-games which Colin Ashby thought Beau Jolly would be marketing. In what may prove yet to be the most dangerous precedent ever set by a member of the software community, New Generation launched its new series of The Complete Machine Code Tutor for the Spectrum (48K), CBM 64, BBC and Atari computers. This was done in quite a clever way, since the computer press are not noted for dashing out to launches of educational software New Gen arranged a competition for the various editors of computer magazines to battle over a game of Trashman — the winning editor to take a weekend in Paris for two. This fiendish ploy was obviously designed to get an ear for the new program as well as setting editor at editor’s throat and starting an internecine war between the magazines! In the end, after a lot of nail biting, the winner was Peter Green, editor of Computing Today who scored 9187 points. He beat Chris Anderson, editor of Personal Computer Games by only 45 points. Chris had played in the first round at the same time as the erstwhile CRASH editor did his bit. Tony Heatherington of Personal Computer World came third with 3138. CRASH was bravely represented by none other than Roger Kean, who despite the disadvantage of a damaged joystick at his regular morning practice, managed to come somewhere after that with two thousand and... something! The holiday was handed over accompanied by a suitable round of booing from the other unimpressed magazines. This is New Generation’s first excursion into the ‘educational’ software market. It is aimed to give the BASIC programmer a step by step guide to learning machine code programming. The Spectrum version contains two cassettes with over 100K of data. 33 lessons follow exercises together with a comprehensive booklet. New Generation claim that the user may experiment without fear of crashing the program and that the high standard assembler in the system ensures fast error trapping and correction. The Machine Code Tutor retails at £14.95 and will be subjected to a CRASH review soon. 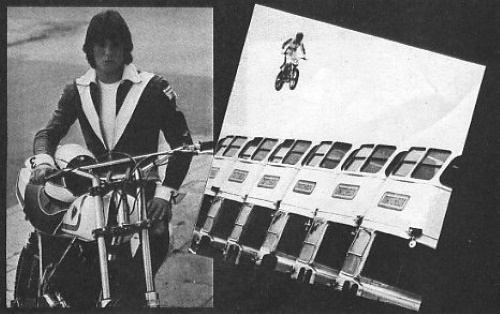 Eddie Kidd, the motor-cycle stunt ace, is soon to be a computer game! Software producers Martech are launching a game called Jump Challenge on the Spectrum (48K) and the CBM 64 this month. Eddie, whose astounding bike jump of 190 feet is a world record, has been closely involved with the game’s programmers for several months, claim Martech. They say the result is a unique, highly realistic game which challenges the player to try and match Eddie Kidd’s skill, timing, control and sheer courage in leaping over increasingly difficult and dangerous obstacles. Well, we’ll soon see. In the meantime, if the real things appeal as much as the game, Martech say that Eddie Kidd will be making personal appearances on the Martech stand at major computer fairs over the next few months. The British software industry has been a little alarmed by the spate of cheap software around recently. Warwick Leisure’s Pulsonic range at £2.99 and the Mastertronic programs at only £1.99 have obviously given cause for alarm. Despite general public calls for lower prices, many software houses feel that it is no longer economically feasible to produce really complicated games at such low prices. Nevertheless a number of well-known companies are preparing to do just that and lower prices. Mike Cohen of Lothlorien says that the market is changing, opening up so that it is possible to sell a particular type of game at around the £3 mark without seriously affecting the high quality game for which Britain has become known at the higher prices. Lothlorien are certainly considering a range of much lower priced games, and a cartel of other software houses are expected to announce low-priced ranges of games before much longer. Software house C.C.S. have also gone onto the lower price range, kicking off with two games in the new ‘Charlie Charlie Sugar’ range. Priced at £2.99 both games are for the 48K Spectrum. Dix Mille is described as a traditional French dice game which can be enjoyed by all age groups. Whodunnit is an investigative game for up to four players and is a computer version of the famous board game Cluedo. Whodunnit looks like one we have already seen released by a company called Placet, but the new version has been rewritten. C.C.S. say that the new range is designed to encourage impulse buying and is accordingly priced within the average teenager’s pocket money allowance. A lot of software houses have obviously noted Mastertronic’s success when placed next to the till a quick impulse buys out of the change from a main game purchase. The question remains — at half the price, on average, of games which have been carefully developed, are these cheapies really worth the money? We’ll be taking a look at the Charlie Charlie Sugars next issue. On a somewhat lighter note PSS have a hardware success on their hands it seems. It comes in the form of 23 year old Kevin Bowes and his motor cycle. Kevin, a printer by trade, started racing motorbikes as a hobby. He progressed well against his local Coventry rivals and came to the attention of PSS who pledged their sponsorship support for 1984. It’s been repaid well. After an early victory in a pre-championship warm up race at Snetterton during March, Kevin has gone from strength to strength, qualifying for the Marlboro Clubman’s Championship, where he is currently lying 5th in the overall Championship table. After an extensive advertising campaign over Christmas period and then endless delays in its release, Carnell’s Wrath of Magra adventure seems to have bitten the dust owing to the fact that Carnell Software has gone into liquidation. At the time of writing, the company has called a meeting of creditors to sort the situation out, but it seems unlikely that Carnell will survive in any recognisable form. The fate of the Wrath of Magra is also in some doubt. There were rumours that the program had been partly financed by the software distributors Websters, but phone calls to Websters resulted in blanks being drawn — they had never heard of it. It is possible that another software house may pick the program up for marketing. Advance reports from Derek Brewster on the game suggest that despite its mammoth length, it contains serious drawbacks including up to 10 second delays in responding to input. So for the time being it looks as though Magra is in mothballs — maybe forever. It seems to be harder to get your Spectrum repaired these days, what with reports of Sinclair themselves taking up to six months in some cases. As a result repair services have become more common. Thomas Walker & Son Ltd., are one such, but in this young business Walkers are hardly new. Established in 1838, the Birmingham-based company has been [an] innovator in the field of machine instrumentation. They hit the headlines in 1980 when they launched the world’s smallest and cheapest satellite navigator to the yacht leisure industry. The Sat Navs, which are a combination of receiver, computer, keyboard and display PCBs, have given the company considerable experience with the Z80 CPU which is the basis of the Spectrum. It seemed natural to move into home computer repairs. Their repair service now includes the Atari and Commodore computers as well as the Sinclair machines. The services offered by Walkers Computer Service and Repairs provide for one-off repairs and quotations direct to the customer and as a support to computer dealers who require back-up to their sales. Professional keyboards for the Spectrum have become quite a business in recent months. Now Kelwood Computer Cases have launched their K-Board. Unlike most other fit-on keyboards, the Kelwood K-Board is not a complete housing for the Spectrum but an assembly which sits on top of the Spectrum’s keyboard and replaces the membrane circuit. The new keyboard fits where the old one was with ribbon connectors replacing the existing ones. The keys are foil printed in red and gold and are claimed to have a fast switching time, with smooth action and a travel of less than 1mm. The keys are shrouded by a plastic moulding on top of which sits the original Spectrum key template. Cheetah Soft (Bat Attack and Conquest) has signed a deal to produce Imagic Software for the Spectrum. Imagic has been producing software in the United States for some time. The first two titles are Moon Sweeper and Dragon Fire and should be available on cassette soon priced at £7.95. Cambridge Computing have recently reduced the price of their Spectrum Programmable Joystick Interface from £34.90 to £29.95 which includes the two independent fire button joystick. The interface alone is reduced from £27.90 to £22.95. At the same time the software used to program the joystick interface has been extensively rewritten, say Cambridge. It is now fully microdrive compatible and additionally can record the key combinations for up to 250 separate games (48K version). In last month’s News Input we reported on some games from a Spanish software house. Some of their Spectrum programs have already been reviewed by us and would have appeared in this issue, but we have been asked to hold them back. The games and all their documentation were in Spanish, but an English software house (undisclosed at this time) has entered into a marketing deal with the Spanish company, Ventamatic, to market the games here in Britain. At present new English inlays and English text graphics are being designed. So we’ll be reviewing them as soon as they are ready.